Walking near the marina in Sausalito, California, we noticed a crab on a rock down by the water. Looking harder, we saw another one. 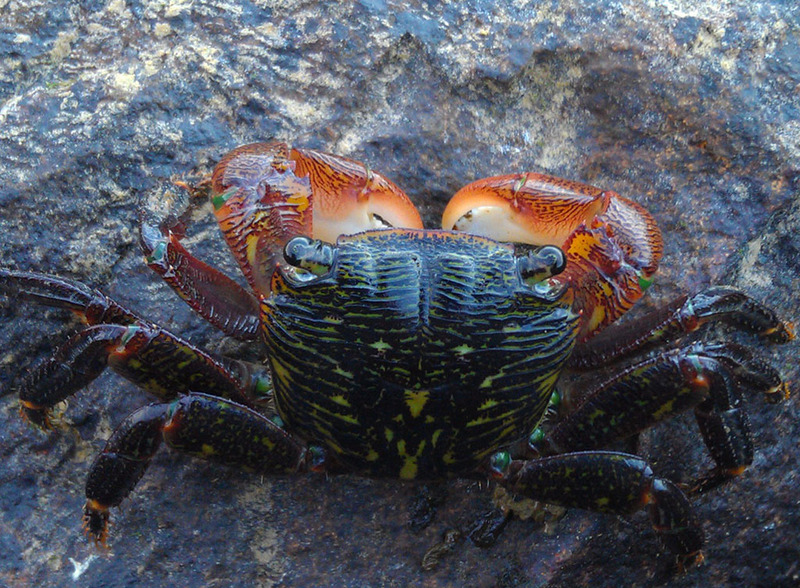 Then another, and another, and pretty soon it became apparent that the rocks were more awash in crabs than in water. (To be fair, this was several feet above the waterline.) The crabs were apparently having dinner, as first one claw and then the other would pick at the rock and go to the mouth, pick at the rock and go to the mouth. The only thing that disturbed the pattern was us, since the crabs were very skittish about dark things suddenly appearing above them. Dark things slowly appearing above them were tolerated better, and this little fellow sat still while my cell phone snapped his picture. HTC Droid Incredible 2, natural light, late afternoon shade. Nice, these crabs are usually fairly tough to approach. I am glad the populations there are still high. Once very common on the rocks in Southern California they have all but vanished now.